What Are Your Charges’ Favorite Fruits? Peaches are one of my charges’ favorite foods. When enjoyed at the peak of ripeness, they have a sweet, juicy flesh that cannot be matched by any other fruit. 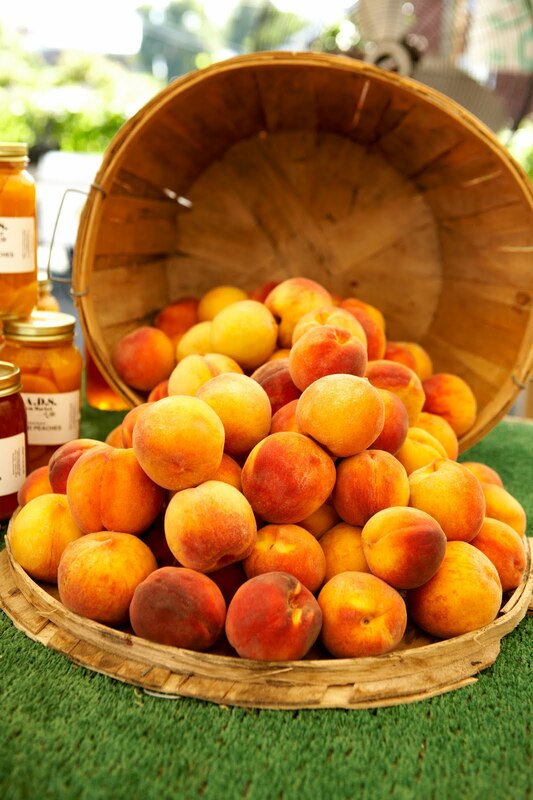 Peaches are in season for a limited time in the heat of summer, with typically months ranging from late June to late August. It’s worth holding out for fresh peaches, for when they are in season, they have the boldest color, flavor, and texture. Enjoy these recipes with fresh peaches when available. Frozen peaches may be substituted as needed, but thaw before using the recipes, unless noted otherwise. I love adding peaches to low-fat plain yogurt. But I recommend the following recipes with the kids. I’m sure they will enjoy them. In a large skillet, over medium-low heat, melt 2 tablespoons of the butter until it foams. Add the brown sugar and stir for 30 seconds. Add the peaches, raise heat to medium-high, and cook, stirring frequently, for 3 minutes. Stir in 2 tablespoons of the cream and simmer for 2 minutes. Transfer to a bowl. Heat oven to 200° F. Place 4 slices of the bread on a cutting board. Divide the peach mixture evenly among the slices, leaving a 1/2-inch border on all sides. Top with another slice of bread and press gently. In a shallow bowl, beat the eggs and cinnamon. Working in batches, soak the sandwiches in the egg mixture for 2 minutes per side. Melt 1 tablespoon of the butter in a large skillet over medium heat. Fry 2 sandwiches until golden brown, 3 to 4 minutes per side. Transfer to a baking sheet and place in oven to keep warm. Repeat with the remaining butter and sandwiches. Beat the remaining cream until soft peaks form. 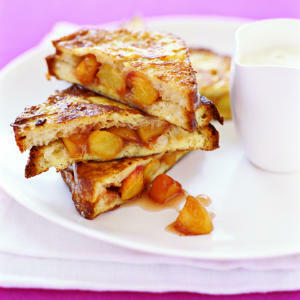 Halve each sandwich on the diagonal, sprinkle with the confectioners’ sugar, and serve with the whipped cream. Tip: If you’re using day-old bread to make the French toast, trim the crusts, which may have become tough. Serve this salsa alongside tortillas. Mix all ingredients together in a large bowl. Chill at least 2 hours before serving. Chicken and peaches come together in a French-meets-Chinese fusion dish. Place flour in a large bowl. Add chicken and toss to coat pieces, shaking off excess. Place chicken in large baking dish. In a medium skillet, combine wine, butter, and broth over medium-high heat. Cook until melted, stirring. Add peaches and walnuts, stirring to combine. Pour over chicken evenly. Bake, uncovered, 30 minutes, until chicken is done and sauce is thickened. Whisk together flour, sugar, milk, and vanilla in a large bowl; add butter and mix until smooth. Place peaches in a lightly greased 9-inch square baking dish; pour flour mixture over. Bake until golden brown and bubbly, 30 to 40 minutes. Remove and cool slightly before serving.